Hi, and welcome to my website. 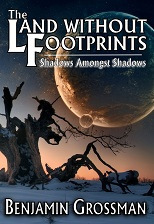 I’m the author of The Land Without Footprints: Shadows Amongst Shadows, which is published by Sweatshoppe Publications. The book is now available in paperback and as a Kindle eBook. You can purchase the novel on Amazon here. And also on Barnes & Noble here. Check out the site and get to know the characters, cultures, and lands of the book a little better! Congratulations! The story is exciting. Thank you so much 🙂 Have a great rest of your day!